The industry's leading solutions for valuers, developers and investors, ARGUS Developer and ARGUS Enterprise, are available as a hosted, subscription-based solution that gives you full access without any setup or maintenance. Whether you are a single user or a large enterprise, ARGUS On Demand offers flexible account management to support your growing business and operates using a single, secure database with state-of-the-art infrastructure giving you access from any computer around the world. Sign up today, and start using today. Signing up is easy. Whether its for just one user or an entire team, getting on ARGUS is simple and just takes a few minutes. Whatever your preference, ARGUS now works on the operating system of your choice. Bring your own device and start ARGUS with virtually no setup. A secure, shared database keeps your entire team informed and working together in real time. No need to set up a server or create a database, ARGUS On Demand does all the work for you. No hardware or additional software investment required to get started. Just a computer and internet is all you need. Let ARGUS On Demand maintain your environment. Download a small plugin for your PC or Mac and you are ready to start using ARGUS. All you need is a free Citrix receiver. You and your users can just point, click and run. Subscriptions that work for you – flexible terms that suit your needs. Get ARGUS for a month or for a year. Pay for the solution you need the way you need it. Manage your account and subscriptions all online. Conveniently add users and renewal options to meet the changing needs of your business. ARGUS On Demand manages your environment and version updates, allowing you to focus on your business. Users have testing windows prior to updates, but let us handle everything else. We're here when you need it. Along with 24/7 monitoring of the production environment, users have access to our standard support and customer community. Our team is ready to help. At ARGUS we break ground everyday with products that provide consistency, transparency, and efficiency into the financial and operational processes that drive the global commercial real estate market. Our products are built exclusively for commercial real estate companies, incorporating best practices learned from over 25 years serving the industry and clients in over 60 countries. ARGUS products are the industry standard. The industry’s leading owners, managers, financial institutions, brokerages and REITs trust ARGUS solutions to improve the visibility and flow of information throughout their critical business processes including asset management, valuation, portfolio management, budgeting, forecasting, financial reporting, leasing and collaboration. 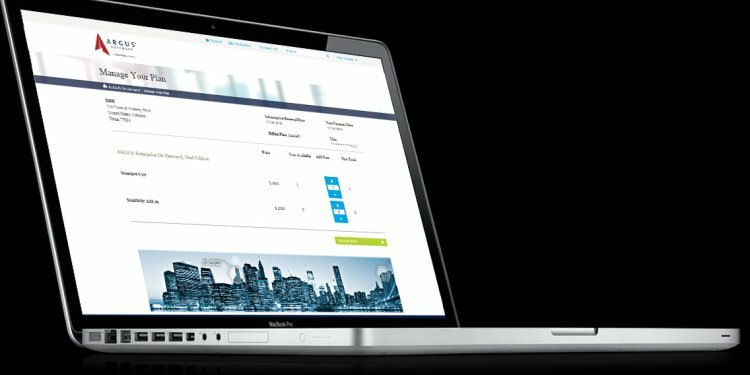 Looking for a more comprehensive solution for managing your assets or institutional investments? ARGUS Enterprise incorporates the world’s most widely-used valuation methodologies into a unified platform providing greater investment visibility and global valuation capabilities across your commercial real estate assets locally, regionally or worldwide.